This morning Ashlynn said, "Mom. Can I borrow your phone, because I want to text Janea and what I want to say is too long to write in a note." We are going to have to get serious about some ground rules before this girl gets her own cell phone this summer. Lately, I've been thinking a lot about this article that I read about our youth and social media. The biggest point of the article that stands out to me is the fact that platforms such as facebook and instagram are creating an environment where a person's self worth can actually be quantified. You can put an exact number on how many followers you have, or how many "likes" you received on a picture. Should our youth have to deal with these pressures? This has made me think a lot about what we will and won't allow Ashlynn to utilize in the future. I haven't come to any conclusions yet, but it's on my mind. If you have a minute, this article is really great. Actually...Ashlynn calls everything with a beat "My Jam!" 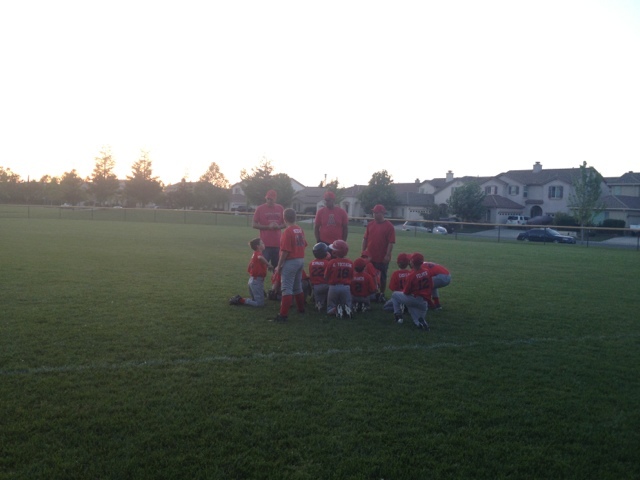 So these little Angels won their game tonight! And they happened to be playing the number one ranked team! So now they are tied for first! I knew, back when we were perusing "Most Awesome Baby Names of 2003" and we decided on the name Briggs, he would be destined for great things (tongue in cheek). On the drive home, Justin Timberlakes song "Suit and Tie" came on and Briggs crooned from the backseat, "Ah yeah! This is my jam!" Then we proceeded to have a little dance party in the car. Not a bad ending to the day when your family pet dies. Good grief. The hamster died. The kids found her. Of course. When I wasn't home. Cause I'm rarely home these days. And I didn't even get a chance to blog about her. Try and be less busy. We released balloons last night in honor of Grandma's birthday today. We all wrote little notes to Grandma and tied them to the balloons. This is the third year we've done this. We also like to have a nice big helping of Grandma's homemade Mac and Cheese. We miss our Grandma. Briggs, always in Dodger gear of some kind. Last year on this date, it was so windy, we barely made it out of the car before our balloons blew away. This year, the breeze was perfect to send the balloons off to heaven. Officially the worst time of the day. an avocado, a bowl o milk and Greek yogurt. On the carpet. And I still have 6 more hours, at least, where I have to be responsive to other human beings. I just made a deal with Ty. If I call him Rover, he'll call me Queen Kate. 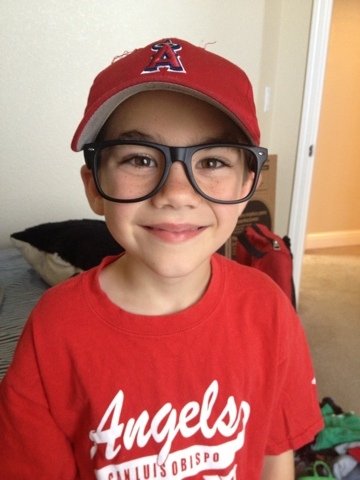 On the way home from school the other day, Ty shouts from the back seat of the Odyssey, "Mom. Today I stuck an eraser in my ear, and it must have fallen out on it's own, because I didn't take it out." What does a mother do with that statement? Once at home I calmly started in on my 700,000 question - with the patience of a much better mother - I don't know where that came from. Probably from the laugh-ability of the situation. "Did you stick your pencil in your ear?" "Were you trying to show off?" OH! and, "Why did you do that?!?" I'll spare you his answers because none of them are fulfilling or make sense. The gist of it was... he just did it. Finding this little eraser in his ear was not as easy as I thought. I did get one satisfactory answer to one of my questions, "Which ear did you stick it in?" At least we had somewhere to start. With the flashlight clamped between my teeth so that I could use both hands to tug and pry apart his ear, I was finally in a position to ask one more question. "What color was the eraser?" One more satisfactory answer for the win. "Pink" So, unless the inside of his ear was unnaturally pink, I was pretty sure I had spotted the culprit. Once inside the office, after telling the nurse the reason for our visit was "An eraser in his ear" the doctor came and took a really cool LED light up wand and quickly and painlessly removed the eraser. You can guess, by the above picture that I asked him, "Would I be a bad mom if I took a picture of this?" I didn't really care about his response, because there was nothing that was going to stop me from documenting this event. Then of course, the doc and I covered all of the other bodily orifices that he was NOT to stick things in. Job. Well. Done. Once at home, Ty told me in all seriousness, "Mom. I'm really glad the doctor took the eraser out of my ear, because I didn't want to have eraser poop." That is just too priceless. How many more years of these childlike little zingers do I even have left? I have to savor it while I still can. Our usual birthday balloon display. I'm not a cake decorator, but Ty insisted on a minecraft cake. So here is me getting all crafty and making a stencil for my chocolate sprinkles. And the finished product. I'm not planning on winning any contests with this one, folks. 015 from Kate Rober on Vimeo. I like to call this next video Ashlynn made, "Glitter Hangover". You'll see why. Filmed on location in her bedroom, and, again, entirely shot and edited on her ipod. Part of the reason that I stopped blogging so much was because of Instagram. It's so easy to snap a picture and upload it to my feed, but I realized that there are some people who don't have Instagram (Aunt Lynn and Janet! Hi!). So I'm trying to not let this blog die out. The kids love looking through the blog books that I have printed every year. So for now, I'm going to try and at least post some of my Instagram pictures here. I call this picture "Two Things I Found in the Backyard in One Day". The kids and Brian were working on a 500 piece puzzle and had it completed except for one lost piece. I found the piece on the back patio. Go figure. I also found this black widow spider the size of a penny. Luckily it was dead already so that I could set up this shot. You've got to get the shot! I love it (not really) when elaborate projects come home with your first grader and even though it says optional in the little bubble, your little one HAS to make it. Ugh! This spring brought beautiful magnolia blossoms on our neighbors tree. I think perhaps Ty should have this shirt. Miss Rosie Cotton likes to play in our Fischer-Price house. Ashlynn loves Rosie. I think she's ok, but would be cuter if she didn't have red eyes. I think they are a bit evil. This note is from Ty, and yes, that is the toilet seat. Good place to leave a note. It was only in the 60's but the sun was shining and the kids were "dying!!" and insisted on going swimming. I didn't have to get in, so I didn't mind. Can you see the line across Ty's face that goes straight into his ear? That's how fast this kids ran past a small tree. It missed his eye by about a centimeter. People in this town are sassy! This is a shot of Brian, in bed, on a 2 hour work related conference call with 4 or 5 other guys, on a Sunday Night. Nothing but romance around here, folks. And Brian works too hard! Gabago from Kate Rober on Vimeo. Ashlynn has turned into a budding cinematographer. Here's a little something she came up with when Ty had a friend over. I taught her what the word "musical montage" meant recently, so she's on a bit of a kick. And, yes, Brian made sure to give her the little tip about turning her ipod horizontal for a better format. But not until after a few videos.